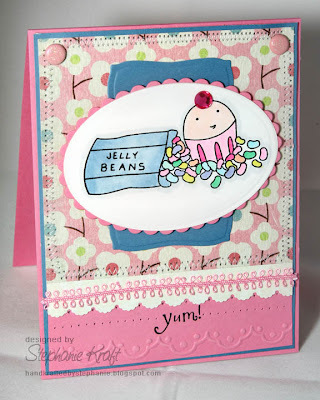 I used Jen's latest Sketch For You To Try on my cuppie card. I finally got a chance to play with this new set from Taylored Expressions! Things were going along pretty well, but then several things went wrong. I stamped my image, colored with Copic markers, then my die slipped when I went to cut out the oval. Then it slipped again when I went to emboss it. Next, when I was putting my card together, I realized that I should have used off white instead of white cardstock... And, finally, when I went to add the oval matted image to the rest of my card, it stuck on crooked... tried to move it, but the foam tape is stuck! So, don't look too closely! LOL! Accessories: Petite Oval and Curved Rectangle Nestabilities (Spellbinders), Frills border embossing folder, Cuttlebug (Provo Craft); Markers (Copic), scalloped scallop border punch (EK Success), ribbon, brads (Taylored Expressions Key Ingredients); rhinestone, paper piercer, foam tape, thread, sewing machine. What a fun card. I love jelly beans!